I have been on an endless (late) search for anti aging skin care. I say late, because apparently in this day and age I should have known to start worrying when I was 18 lol I exaggerate, but girls really are a bit too precautionary about aging. I do indeed know 18 yr old's using wrinkle cream as if it will stop time and gravity, before it starts. Not so ladies. It's nice to think about in fairy tale land, but the only thing you can do is moisturize, use sun screen and treat what you already have. Seriously, we are a society much more obsessed with the process of age than a decade ago. At 18, I was not at all consumed with the thought of wrinkles. I was consumed with graduating high school, meeting boys and getting rid of rules, not wrinkles. For women my age, I am lucky to have more options at my literal fingertips. I have realized that not all treatment creams are a hoax and we have come a ways with skinterventions. My word for improved skin care via chemically harnessed innovation. Yes, a lot are just empty promises, but some actually do bring about change and it is never over night. 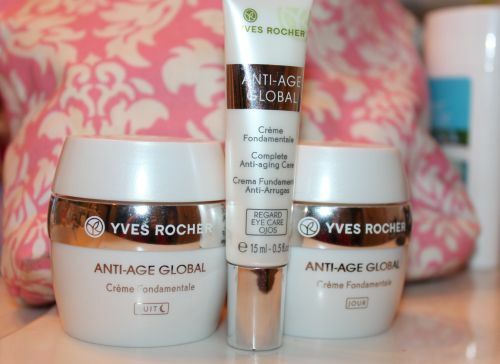 With Yves Rocher Anti-Age Global, I can honestly say that I have witnessed noticeable change. 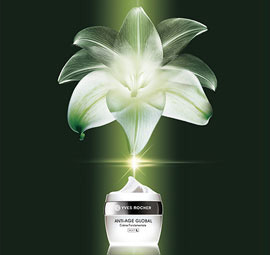 This skincare utilizes 4th generation plant source cells which claim to be the source of regenerating the skin. The Anti-Age Global line is meant for those in their 40's but clearly states it can be used by those in their 30's. Basically, whoever has fine lines or wrinkles, it would work for. This formula was tested and showed results in different areas of age prevention and treatment in 74-80% of the testers, between the different products. This was in a span of 1 month's use. I think that's a high enough number to give it a shot! Keeping skin supple and combating dryness is important. Dryness can make you look so aged before your time. A lot of us even suffer other skin issues, which makes it harder to find the right product for you. I suffer dermatitis and adult cystic acne, along with comedogenic acne. (Acne caused by things that irritate or clog your pores) I treat it as best I can and try to stay away from anything that will irritate it. This stuff I can happily say does not do either. The Day cream: It is thick, but not too thick and goes on rather taught. What I mean is to say that it takes a little work to rub in and I think that is where the firming may take into effect. I am not sure though. It's not a work out or anything, but compared to the night cream, you have to work it in. I love that though, as it feels like a mini massage. 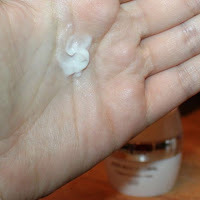 You just have to be careful to spread it slow and lightly around your eyes, where the skin is most sensitive, but you can skip the eyes and just use the eye cream I describe below. It smells fine, nothing offensive or over the top. This is incredibly emollient. It does not contain spf as far as I know, so I layer this on top of my normal moisturizing sunscreen or wear it on overcast days or when i'm not in the sun a lot, which is 99% of the time. I do love when cream includes spf, but often times that irritates my skin to no end, so It is probably a blessing that I can use my own spf regimen. The Night cream: It goes on like a dream, incredibly emollient like the day cream, but takes on a softer application. It has the same scent that dissipates within an hour or so. I usually prefer unscented creams, but this does not bother me. This stuff leaves you so moisturized, it is wonderful. A little also goes a very long way. I wake up with supple and soft skin. I love the feeling. I think this night cream might just be a Holy grail of mine. It is definitely the most moisturizing I have experienced to date. The Eye cream: It is just as moisturizing as the above. The same consistency is had and it aids in the suppleness the moisturizer already gives. I use it at night and just before I put on my eye concealer. I did not see an improvement in my eye area, but my eye bags and dark circles are pretty resistant and it may be due to allergies in my environment :/ I will keep using this though, to see if it does anything. It may just take longer. Results: I have seen results from the face creams after about 3 weeks of constant use. I stayed dedicated to this regimen. There is a certain glow I can't explain. It gives off a healthier appearance. I feel like I don't look as drab. I also notice that I don't break out and it has helped my dermatitis or at least not aggravated it like so many other products do. I haven't seen any drastic changes, but I think I did notice more firmness. It's hard to tell, because of my more "full" face at the moment. The one thing I did notice rather drastically is that the emollient and sort of glow of this formula does in fact disguise my fine lines. I don't have deep lines, just a few fine lines. I'm thinking that this would be wonderful for deeper lines too, given how it works on me. The other big thing is that it lasts all day without becoming greasy. It just sinks into your skin like a sponge and stays there. It's also amazing to apply makeup over. It makes my under eye concealer glide on much more smoothly and I have noticed that it doesn't settle into my fine lines as much, which is a big problem with the concealer I use now. I am very happy with the results so far. Very nice review! Love how you included photos and discussed from beginning to end of how the product worked! Those products look really amazing. I am not showing the signs of aging yet, but I need to get this so I can prevent them. Thanks for an awesome review. I'm right there with you- I am just recently started thinking about anti-aging and such. I've heard of this brand and it looks awesome, thanks! Awesome! I need to use anti-aging, but have never heard of this. I am going to look into it! Wow, you've seen results in as little as 3 weeks, that's amazing! Thanks for the information, I've never heard of Yves Rocher before. That is awesome, I love the fact you have results in like 3 weeks and your review is very detailed, love it!